This curly, wavy look is big for Fall 2009 - Winter 2010. It's the Mariah Carey 'Vision of Love' hairstyle from the 1990s. And yes, Mariah has gone back to her roots with a pretty version of this do. We happen to like it, and already, the spiral curl style has been popping up on the red carpet. 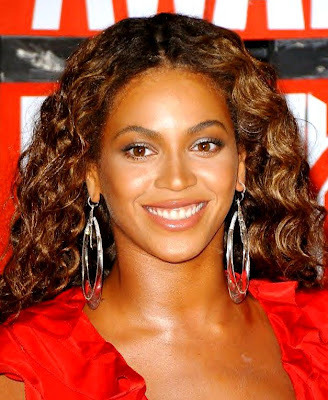 Beautiful Beyonce Knowles was rockin' this hair at the recent Video Music Awards show. And we know this curly look is a hot trend for Fall, because celebrity stylist Kim Vo made a mention on Twitter, about loving Beyonce's big curls. Taylor Swift has been sporting the spiral curls and Miley Cyrus has been photographed with a looser, but still very wavy set of locks. You can get this look by perming. Or spritzing your hair with styling lotion and then making lots of tiny braids overnight, and awakening to a mass of wild curls. Or you can take a curling iron and wind your way to bouncy, coils of spirals. Either way, long, spiral curls can give you some wonderful cascading volume and a new classic look for those cold days ahead. Luv Mimi's curly hair! !And the color is prettier just a bit darker.